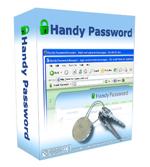 Handy Password is a multi-user password manager and a form filler for Windows. The password manager stores your passwords in one database and automatically logs you to sites or windows accounts filling login and password fields. You can use Handy Password like a single sign-on solution for an enterprise password management. Handy Password is a Password manager flash drive that improves your Internet browsing while also increasing your mobility, as you can enjoy quick logins to websites wherever you go. All your logins, passwords and bookmarks to favorite websites, mail accounts and Internet services are stored on a USB flash drive. Handy Password is designed as Internet Explorer Add-on and Firefox Add-on to provide added functionality to your web browser. NEW! From now on Handy Password can work as a password recovery tool that helps with restoring any forgotten password! Have you ever wondered how much time you spend filling forms while surfing the Web? Whenever you need to register in a forum or chat, open an account or enter your mailbox, you need to fill forms. Sometimes these forms are really basic and require only general information such as your first and your last name, and your login and password. However, more often than not you will need to fill really detailed and extended forms with many fields. No need to fill forms manually. No need to type your personal information. Auto login function for automatic filling and submitting of forms. Save your time with Handy Password! No need to remember passwords. No need to save passwords with automatic password keeper. All passwords and personal information are stored in one place. Password manager saves passwords to a protected structuralized database. Secure password storage of passwords and personal information in one database. Secure protection against keyloggers and spyware. Database on the email server so you could work with Handy Password even when you are not at home. All of these features combined can greatly elevate your web browsing experience, reduce online time and in the long run save your money. Install Handy Password on your PC or USB flash drive now, and enjoy fast and easy Internet browsing!